February’s round of Collabor88 is just around the corner, with a “Storytime” theme characterized by bold, warm colours in extraordinary designs. For this month The Loft and Aria have designed the Hargrave Dining set, a beautiful set with hints of art nouveau style and contemporary accents. The Hargrave table, and buffet, made of beautifully detailed wood, with dining chairs in a contemporary vintage style invites you in. The chandelier, and candle sticks, with their uncommon shapes add a unique accent, while the mirror and lamp give a subtle nod to the art nouveau style of the early 1900’s. The wall art, book stack, and vase with hydrangeas compliment the set perfectly. The Hargrave table is available in a dark, rich cherry wood finish as well as a traditional oak wood, the dining chairs come with floral, solid, and leather texture options, while the wall art comes with 8 choices to create a custom look. The vase, candle sticks, chandelier, mirror and orbs each come with a selection of metallics, and the table lamp comes with 6 colour options. The chair comes packed with poses for dining, desk and general sitting poses, some which include auto attach and rezzing props. The Chandelier, table lamp, and candlesticks can be turned on and off as well. This set totals 28 land impact as displayed, and each piece is copy and modifiable. With 2017 in fill swing, Uber is ready for their first round of the new year, and for this round The Loft and Aria have collaborated on the Rue Living Room, modern contemporary vibes with clean straight lines, and a small touch of vintage. The Rue Living Room is a modern show stopper, featuring a leather sofa with crisp edges, accented with bold patterned throw pillows, Vintage 1960’s inspired chairs are the perfect compliment, adding a warm wood colour and unique shape to the set. A large round coffee table, metallic accent table, and sleek modern console finish off the base pieces of this room. Decor for the Rue Living room includes an industrial style pendant lamp, unique styled floor lamp, world map wall sculpture, framed art and wooden clock. As well as a cluster of modern vases, potted cactus, potted plant, and decorative book with apple sculpture. The Rue sofa is available in multiple colours each with PG/Family or Adult options, and the chair has a hand full of single poses, both with auto attach and rezz props. The chair, throw pillows, wall sculpture, ceiling lamp, floor lamp, accent table, coffee table, cactus pots, vases, and book with apples all have texture change options, and both lamps turn on and off via menu. 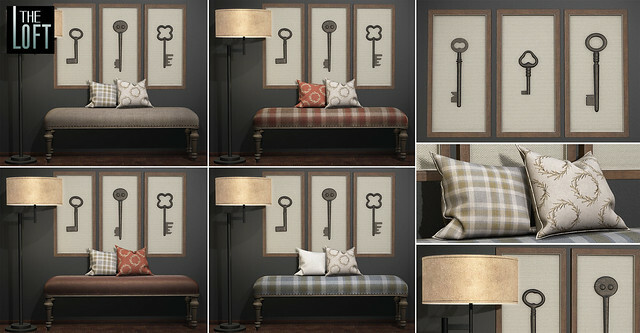 Purchasing the entire set gives you more than enough texture changeable options to make this room truly yours. The Rue living room totals 50 land impact as displayed, and each piece is copy and modify. Come pick up this set at Uber opening January 24th. 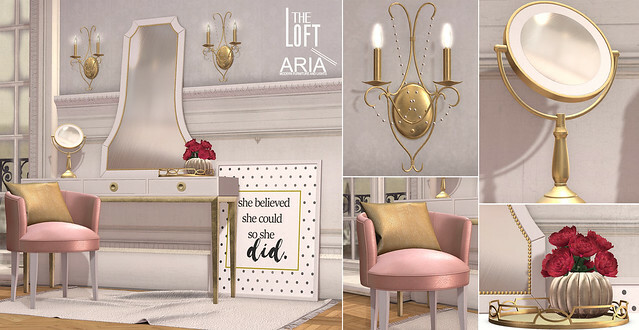 Collabor88 is back for this years final round with the theme “Sugar Plum”, and the fairies at The Loft and Aria have come together once again to create the Lainey vanity set. Get yourself ready for the holidays in style with this classy, sophisticated vanity set. With vintage inspired accents and contemporary flair this set is sure to make a statement in your home! The Lainey vanity table’s contemporary style is the perfect base for this set, a modern take on a classic mirror with nail-head accents sits atop the table. The Lainey chair pairs well with up to date take on classic style. A beautifully detailed sconce, wall art, throw pillow and rug are also available along side a light up vanity mirror, tray, and vase of peonies. 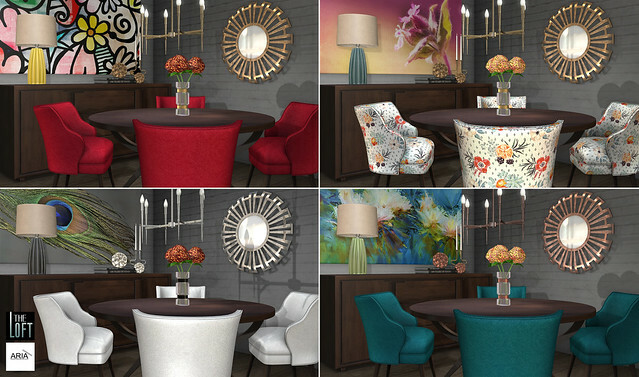 Each item excluding the wall art are available in different colour options sold separate, or if you but the full set all colours are included via texture change menu. The Chair is packed full of singles poses some with auto attach and wearable props. The sconce and makeup mirror both light up when clicked. The Lainey set totals 23 land impact as displayed, and each item is copy and modifiable. The Lainey set will be available at Collabor88 through to January 6th! The Nolan entry way bench is the perfect combination of rustic and contemporary to suit almost any home, creating an inviting spot to sit and take your shoes off. A pair of coordinated pillows placed on top add a touch of cozy. And a set of vintage keys displayed in burlap wrapped shadow boxes dresses up the walls, while a floor lamp provides a warm inviting glow. The Nolan bench is available in 2 options, a linen look with burlap and plaid textures, as well as a leather cushion with aged leather options. The decorative throw pillows have texture change options as well. The bench is packed full of poses, some with auto attach and rezz props. The Nolan entryway set totals 16 land impact as displayed, and each item is copy and modifiable. This set will be available at Fameshed until the end of the month! Oh Tannenbaum, oh Tannenbaum… Coming back for the 2016 holidays is Tannenbaum Holiday Market, and baby its cold outside, so lets stay in with The Loft and the Tivoli Fireplace vignette, a contemporary set perfect for the holidays, or year round. The Tivoli Fireplace, with its updated classic style, is perfect to warm you when the snow is up to your knees. The mirror, decorative deer, candles, and vase with branches add a contemporary twist. And stockings with snowflake holders are the perfect place for you to hide small gifts for the family! 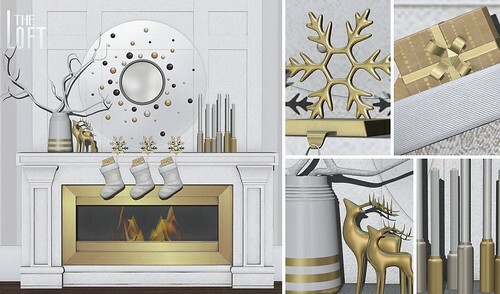 The Tivoli Fireplace includes a handful of singles poses, some which include wearable props. Each item excluding the mirror include texture change options. Tivoli Fireplace totals 35 land impact as displayed, and each item is copy and modifiable. Come pick up this set at Tannenbaum opening November 25th. Collabor88 is ready for the November round with the theme Creatures of the Night. With this unique theme and bold colour palette in mind, The Loft and Aria have created the Aradia set, a classy yet curious set with bold, striking features. The Aradia settee catches your eye, a classy high back piece with contemporary lines, contrasted by the unique side tables, and the striking light fixture. An elegant contemporary standing mirror, potted orchid and faux hide rug round off this set. All items come with texture change options with purchase of the full set. Individual colours are sold individually as well. The light turns on and off when touched, and the orchid comes with texture change options. The Aradia Settee comes in PG and Adult options, each packed with single and couple animations, some with auto rezz and wearable props. The Aradia set totals 27 land impact as displayed, and each item is copy and modifiable. 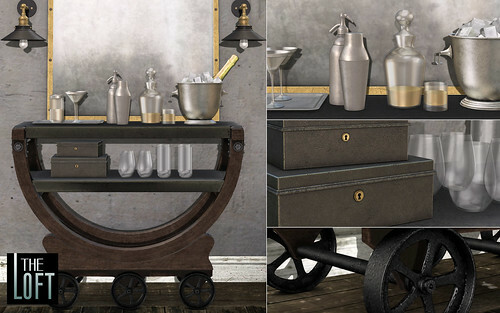 The Pepta Drink Cart set, a classic industrial staple piece, perfect for serving cocktails and champagne. This wood and iron cart, inspired by a cart used to transport spools of paper in an early 20th-century factory is made with aged wood and foundry cast iron. Paired with metallic accented wall sconces and a mirror, as well as assorted decorative drinks and glasses, an ice bucket and a pair of metal boxes. Each item sold separately. The sconces, drink tray, and ice bucket come with texture change options, and the sconces turn on and off on touch. The Pepta set totals 14 land impact as displayed and is copy and modifiable.